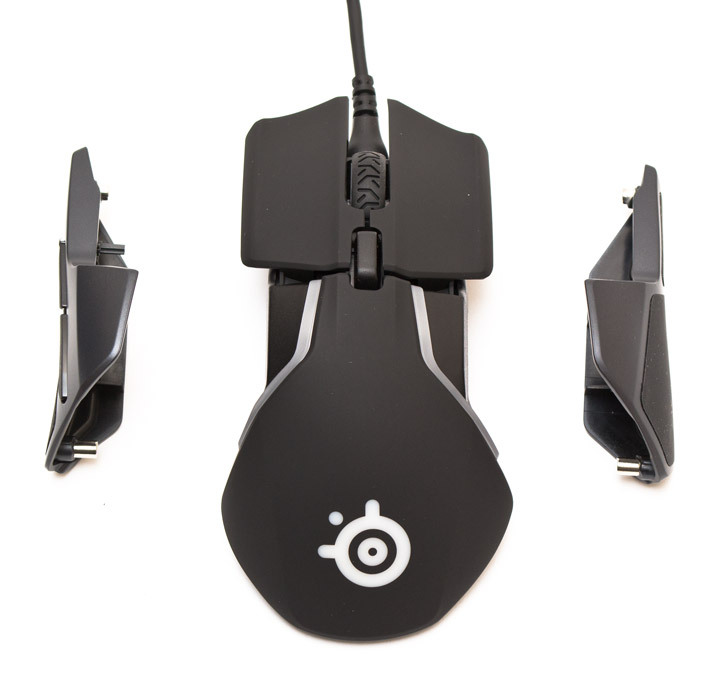 After successful release of the manipulators Sensei 310 and Rival 310, which in their parameters could well claim to be the “top” solution, although positioned as the middle segment, it was not entirely clear which direction the SteelSeries is going to move on. It would be logical to update somehow the flagship Rival 700, because competitors in the face of Razer and Logitech did not waste time in vain. The first rolled out models such as Basilisk and Naga Trinity. 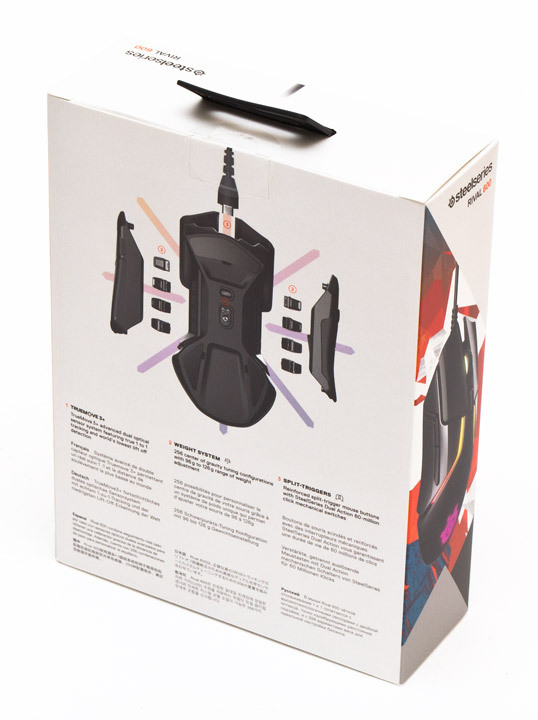 And the second one relied on wireless gaming peripherals – G903, G703, G603 mice. Yes, and already old G502 can not oppose something. 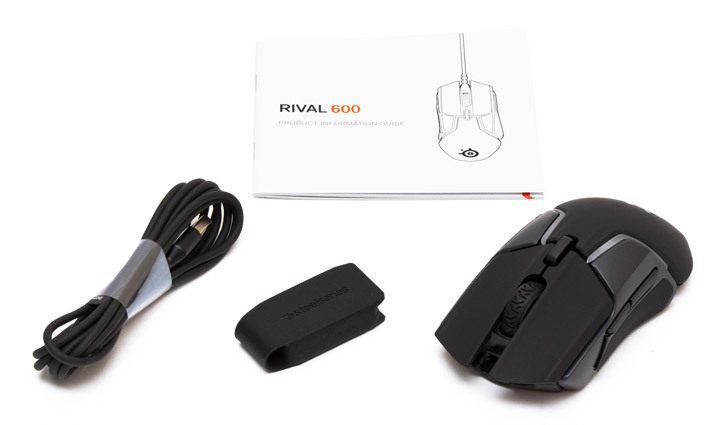 In general, Rival 700 decided not to touch, but instead released a free-of-charge model Rival 600, which is a direct response to the Logitech G502 and Razer Basilisk. And what is its main “chip”, I will tell now. Mouse package looks pretty nice in its combination of white, black and orange colors. If you look closely at it, all the basic trumps of this device become clear: an improved optical sensor with a tear-off height control module, a weight system to change weight balence, improved switches and a detachable cable. Short technical specifications are indicated on the right side of the box. 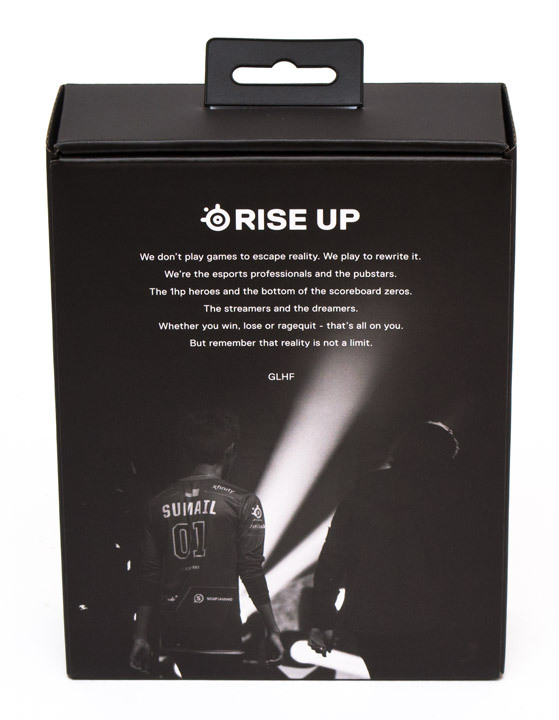 Under the outer cover hiding an inner box of black color that has an image of the Suma1L player from the back and a touching text that ends with the traditional wish for a good game – GLHF (Good Luck, Have Fun), which looks particularly sarcastic if you recall the character and manners of this cyber – athlete. Under the lid is a manipulator in a plastic tray, next to it a box with weights and cable, and the instruction is hidden in a pocket. 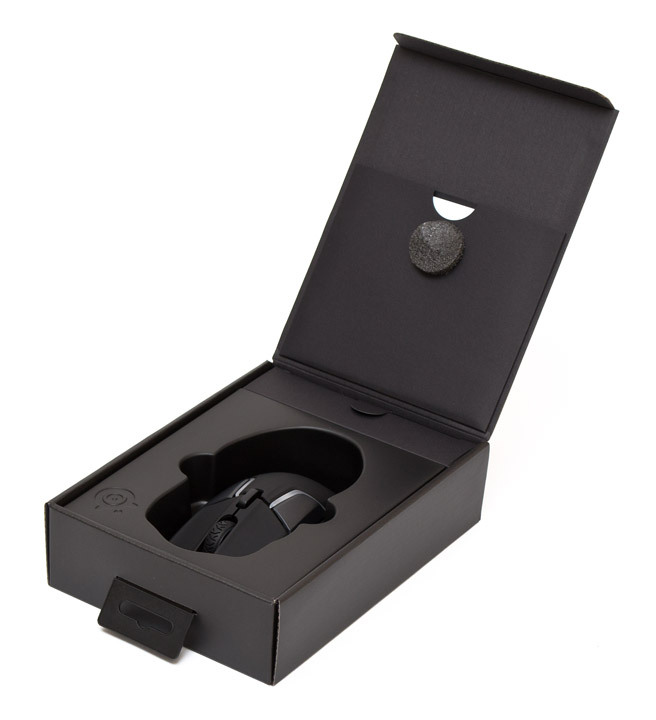 The package includes a mouse, a set of eight weights in a rubber case, a removable USB cable and instructions. 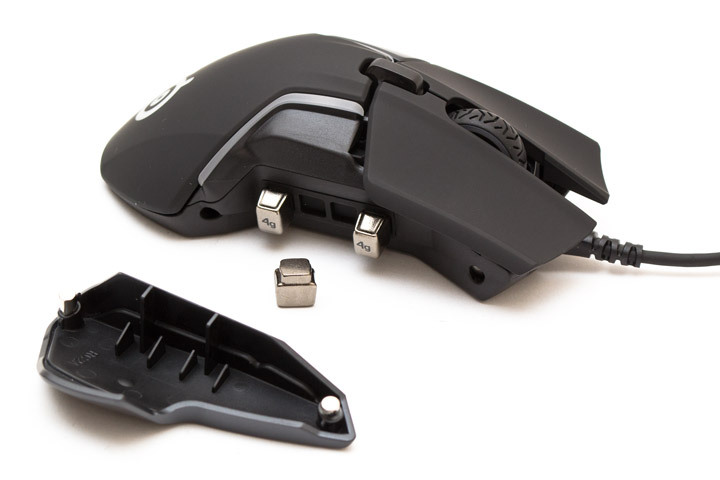 Appearance Rival 600 has a little more pretentious elements than it usually does in its manipulators SteelSeries. Visually, the upper panel consists of separate zones, with different colors and types of coverage. The two main keys are separated from the case and have soft-touch coating, which is nice to touch, but gets dirty quite quickly. The same surface is also on the rear panel. The main buttons are pressed clearly, with medium effort and no reserve of free running. The mute sound is muffled, the button panels do not have any backlash. The manufacturer claims for them a resource of operating time for the refusal of 60 million clicks. Side inserts are made of gray matte plastic with an outflow and are separated by two strips of RGB-LEDs. The scroll wheel and the resolution switch key also “hang” on their own. 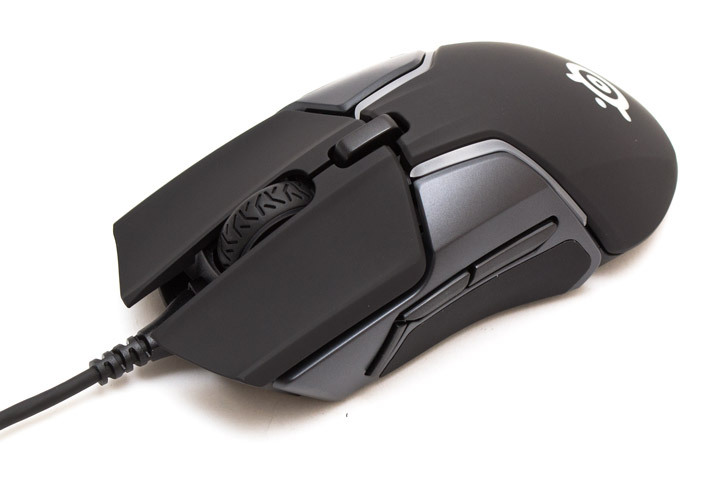 In shape, the mouse is asymmetrical and represents a cross between the usual Rival 300 contours and the chopped G502 faces. Unless from a support under the big finger here have refused. The resolution switching key is touch-sensitive, pressed with medium effort and a quiet tripping sound. If you hold it for a few seconds, the mouse will perform a forced calibration of the tear-off height. However, she does it the same way, every time you turn on the power. Left side panel is made of gray plastic. The place under the thumb has a very pleasant to the touch silicone overlay with soft-touch effect without texture. Above it are three weakly pronounced lateral keys, two above and one at an angle in the front. They can be groped by a rough texture, which tactilely stands out from the smooth sides of the case, but you can not accidentally press them exactly. Activation force of all three keys is average, but the sound of triggering is different. As if under them there are different mechanisms. Front button is the loudest, the middle is deaf, and the rear one sounds a little louder than the middle one. In addition, to press the front vertical button, it will have to stretch, changing the position of the palm on the manipulator. 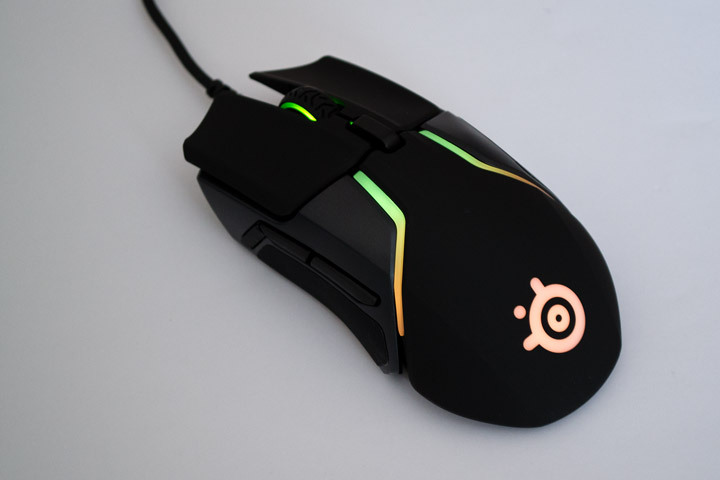 Ability to adjust the weight and its distribution along the axes is a new feature of Rival 600, which SteelSeries did not use in any of its mice before. It is realized by a set of eight weights arranged in a row of four on each side of the device under the sidewalls. Side panel fits tightly on the two magnets and is easily removed, after which the weights can be inserted into the rubber sockets in the desired configuration. Configurations to the word can be 256, if you take into account both sides and options at all without weights. Disconnecting the mouse to change its weight is not required. The weights are contained in a comfortable rubber cover. 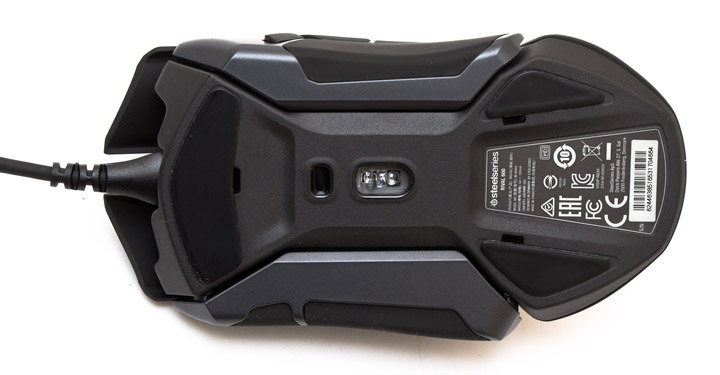 They have a weight of 4 g, but by simple measurements you can calculate a more accurate value – 3.75 g. The mouse weighs 98 g by itself, and 128 grams with a full set of additional weight. Front of the mouse raises some questions. The main one is why does it look like it was forgotten to finish? There is a large hole in front, which, probably, serves to collect samples of “game” dust, over which the panels of the main keys hang. The cord is removable, connects exactly in the middle, is at a decent height above the surface and has good protection against bending. 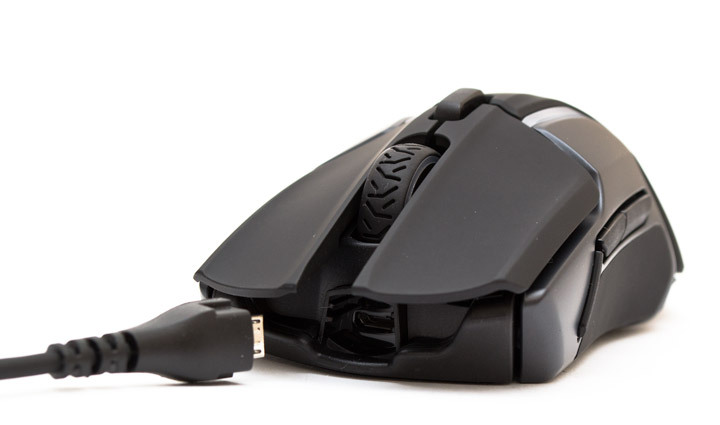 Rubberized scroll wheel is tactile and clear, with well-perceptible locking positions. At fast scrolling there is a characteristic crack which, however, it is impossible to name irritating. Average key under the wheel is average as for the force of pressing, and for the activation volume. The USB cable itself is thick, has a length of 2 meters and is stripped of braids. The degree of rigidity is average, it does not sag, but does not interfere with the movements of the manipulator. Near the connector is glued a traditional flag, reminding you to download the software. Latching connector has its unique shape, ensuring a tight fit of the cable into place. But it is wide enough, because it will fit any other standard Micro-USB type B cord. That is, in case of cable damage, there will be no problems with its temporary replacement. 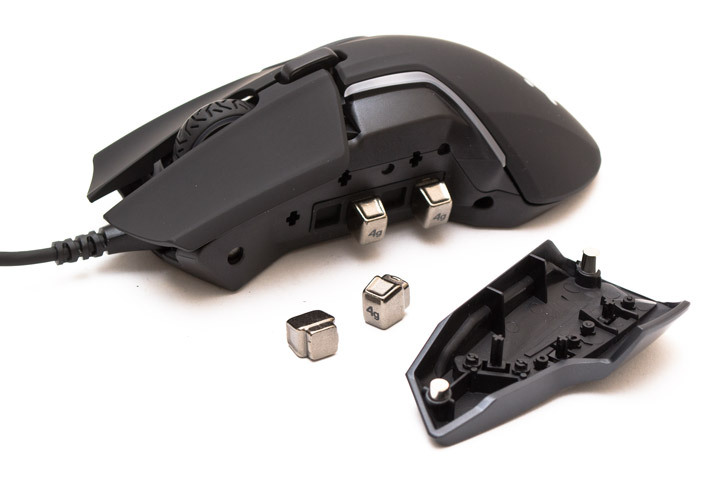 There are no side buttons on the right side of the mouse, but on it there are just two silicone, velvety to the touchpads under the ring finger and little finger. Right panel is also removable, keeps on magnets and under it you can put four extra weights. Mouse fodder has classic rival for the family of rivets, with a small bump on the left. In the center is the company logo with RGB-backlight. The grip causes the bottom edge, where the top panel connects to the base. There is a 0.8-mm gap, which in the past models was not exactly. The error in assembling this or that was conceived is unknown. 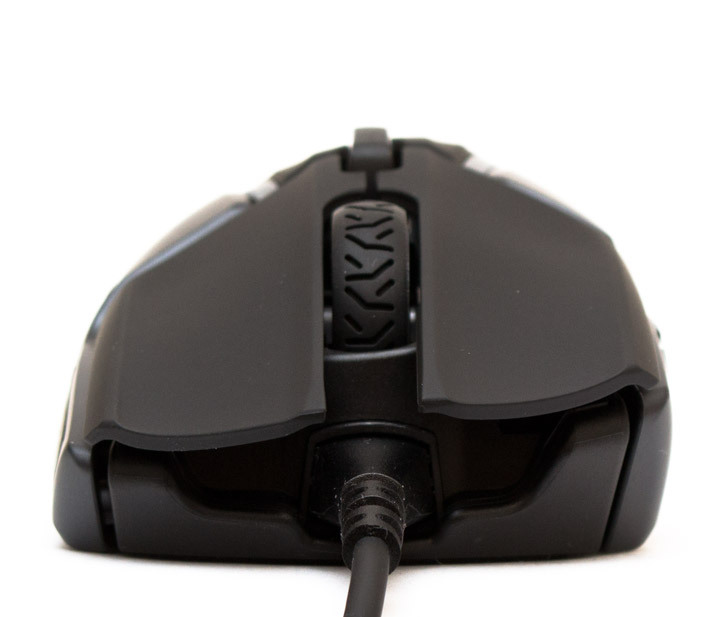 The ergonomics of the Rival 600 are entirely asymmetric and designed for the right hand. The body perfectly lays down in the “palm” grip, normally in the “finger”, and slightly worse – in the “claw”. Since the balance of weight is adjustable, then after choosing the type of grip, it is advisable to set the weights so that, when detached from the surface, the manipulator maintains its horizontal position and does not tend to collapse forward or backward. By the way the mouse looks quite entertaining and without side panels. Perhaps someone will like this version of the ergonomics of the case, as an ultralight manipulator. Especially since with protruding sides of the weights it looks generally epic. Teflon legs on the base of three: one large in front and two smaller behind. They are equipped with hooks to facilitate dismantling. The TrueMove3 sensor is located centrally (PixArt PMW 3360 firmware). 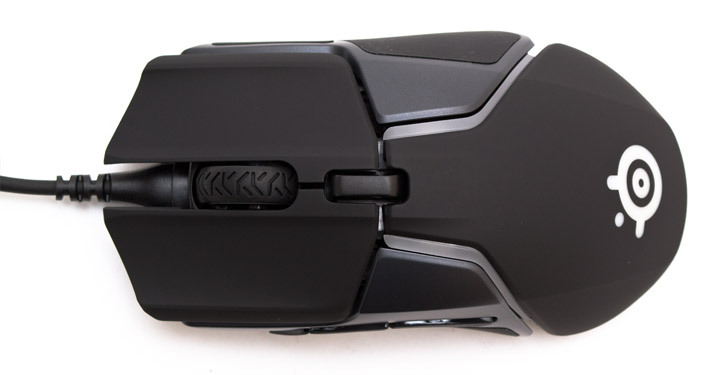 In front of him is the proximity sensor window, which is responsible for controlling the height of the mouse’s separation (turning the sensor into TrueMove3 +) and this is the second major feature of Rival 600. The mouse scrolls the scroll wheel, logo on the stern and two strips on the sides. Each of the light strips has three separate illumination zones, therefore, in total, eight zones are obtained on the mouse of these zones. LEDs can correctly transmit all colors except yellow (casts green) and white (has an admixture of blue). 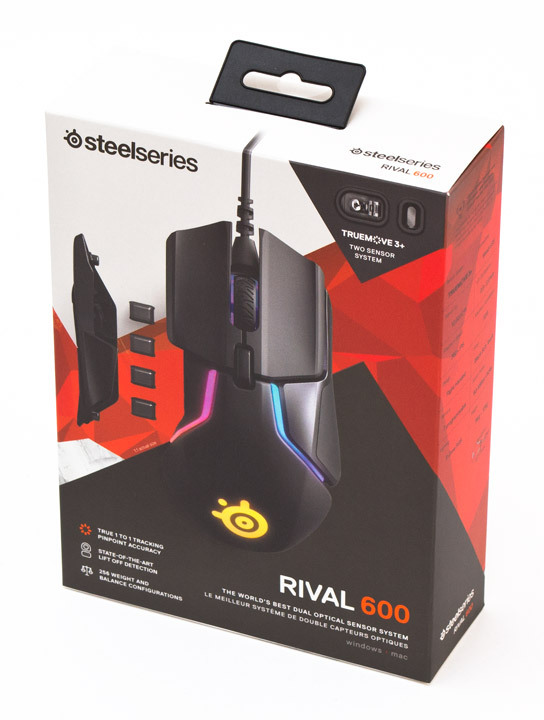 I’m not afraid to say that the SteelSeries Rival 600 is one of the best manipulators in the modern park of peripheral devices, which is constantly filled with a lot of new brands and manufacturers. It was created as a direct competitor for the Logitech G502 and Razer Basilisk mice, made on the basis of the same sensor and having a similar hull shape and a set of functions. And it was this option that I liked most of all on the totality of characteristics. 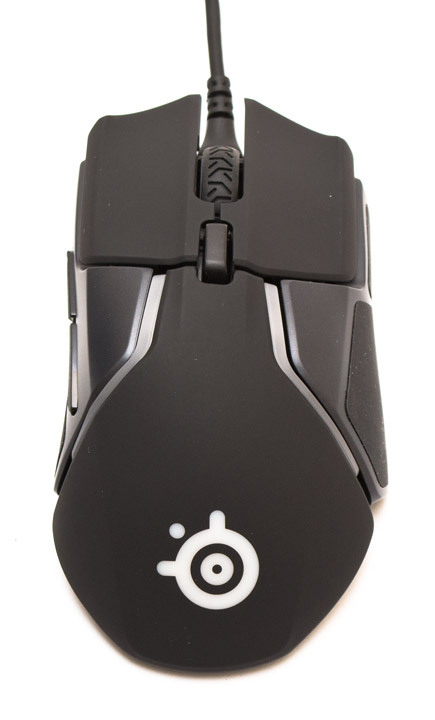 The main advantage of Rival 600 is the minimum height of detachment from the surface, which is achieved by means of an additional sensor that controls the distance along the Z-axis. Weight balancing system first appears in SteelSeries, but all other brands have already had it before. It is positive that possibility of changing weight here is much more elegant and functional than in other similar models. In other words, it does not just weight in case, but actually allows you to shift its center of gravity to where you want, depending on the user’s grip. Other pleasant little things are an excellent sensor, very nice silicone sidewalls, good switches under the main buttons and a good scroll wheel. 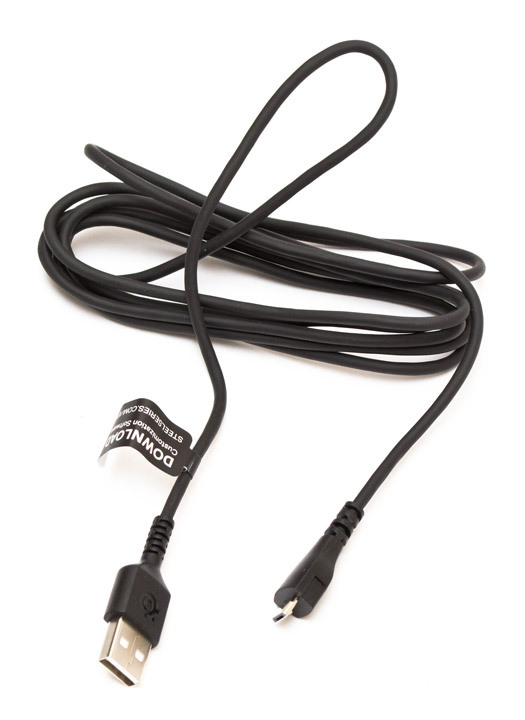 Plus – a removable cable, which can easily find a replacement in case of wear and quite a decent-looking backlight. In general, a full gentleman’s set for an experienced player. Of the disadvantages of Rival 600 can be noted inclined to contamination soft-touch coating on the main buttons and the top panel, the gaps in the assembly of the case, not the correct transmission of yellow and white backlight color. In addition, the front side key is inconvenient. 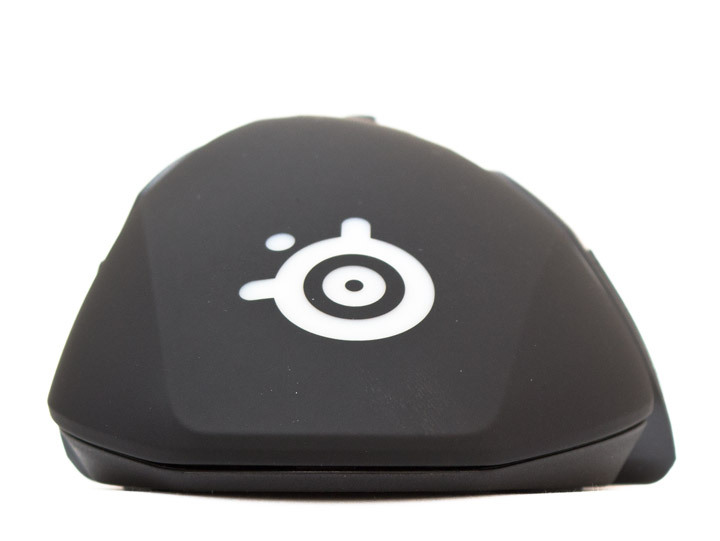 The SteelSeries Rival 600 is a high-end manipulator, in which the PMW 3360 sensor is possible up to new heights. One of the best for today among what could be invented by the manufacturers of gaming peripherals. Recommended for the acquisition of professional players who participate in competitions.